Opinion Poll: Did you enjoy Kiran Rao�s Dhobi Ghat? 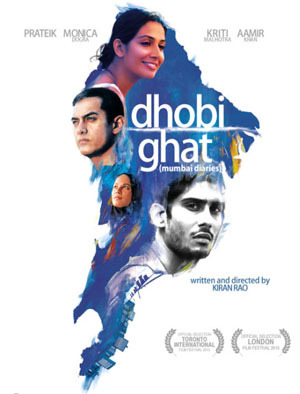 Kiron Rao’s directorial debut Dhobi Ghat is not an easy watch - blink and you will miss something. Small gestures are played out on a large canvass and observation is paramount. The characters observe each other; we observe them and make our assumptions. If you watch primarily Bollywood commercial films as I do, then this film presents challenges but is not unrewarding. Essentially an art house film Dhobi Ghat is song-less, compact, a little languid and grounded in the type of reality which Western international film viewing audiences - admire. I did feel sorry for the folk who cheered enthusiastically when Aamir Khan first appeared because it was apparent that they were seeking a reprisal of Ghajini or maybe 3 Idiots. The lives of four vastly different people are intertwined in a manner which highlights their relationships to each other and to the city of Mumbai. Arun (Aamir Khan) - the painter - views the city from his balcony but also through another character’s recorded diary. Shai (Monica Dogra) - the affluent NRI with a passion for photography - studies it through a lens. Munna - the dhobi (Prateik) is able to intrude on many different lives as he makes laundry deliveries that allow him to momentarily access worlds outside his social boundaries. With all these wonderfully visual perspectives competing for space, it would have been tempting to overcrowd the story with imagery but Rao and her editor Nishant Radhakrishnan (Walkaway, Ghajini and Outsourced) have been very selective. The visual collages presented serve to reflect on the psychology of the characters - to tell the story and no more. Radhakrishnan’s background in editing documentaries (Frontline TV series 2000 - 2004) has perhaps prepared him for the task of fusing complex layers into a seamless whole. In a sense it may have been less misleading to cast a less known actor in place of Aamir Khan. It is not that he is unsuited to the role of the artist recluse - in fact quite the reverse. Although Khan gives a contained and understated performance, he is just too emphatic a presence. It’s hard to suspend disbelief when you have megawatt star power blazing in front of you. Instead of getting lost in his character, I found myself thinking about the actor and how different this role is from his previous ones. Casting is more successful where the other characters are concerned; they meld convincingly with the rather raw environment intensified by deliberately disconcerting hand-held camera footage. Monica Dogra and Kriti Malhotra give subtle, beautifully articulated performances which are all the more fetching and surprising because we don’t have preconceptions about their capabilities. The plum role in this line-up is Prateik’s. His trajectory is the most dynamic and a great vehicle to display a newcomer’s talent. The actor has done well to be selective about roles. This one showcases his capacity to emote through stillness, lift our awareness through slight changes in expression and move through a gamut of emotions ranging from neutral -subservient to hysterical with practically everything in between. Kiron Rao has crafted a complex screenplay and elicits restrained and polished performance from her cast. Films that deal unconventionally with unconventional subject matter often require that viewers adjust to particular rhythms of story telling. We are not indulged or instantly gratified but told to ‘hold on - keep watching - in the hope that we can make sense of what is happening’. And the rewards are there aplenty in this film. The time spent setting up the premise pays off in the surprises it is able to deliver. These would not have been possible if there hadn’t been some initial restraint or holding back of information. I once watched an artist narrate an epic story through manipulating sand pictures on a lit frame. At first one could only guess at the image taking shape because there were only suggestions but with a flick of the artist’s wrist and a handful of sand swept strategically across the frame, she would construct a new reality for us to consider. Rao’s film progresses in a similar manner. For - who would think that a set of tapes that Arun finds in an old cupboard in his apartment would carry such meaning? Who would suspect that the dhobi’s infatuation with the NRI could reach such poetical heights? Who could predict that a ring found in a rusty box could become a metaphor for redemption? Music composed by award winning Gustavo Santaolalla pulses and percolates in the background without spilling into the viewer’s consciousness so in sync with the film’s intention. This is a non-commercial work with cross-over appeal in the niche domain of international/world cinema. I confess to being a lazy viewer who likes to be entertained so I thank Kiran Rao for giving me a much needed work-out. I also thank her for tempering sadness with resilience and leaving us with an up-beat finale.